Drawn and Quarterly, 9781896597898, 184pp. A westerner's visit into North Korea, told in the form of a graphic novel. Famously referred to as one of the "Axis of Evil" countries, North Korea remains one of the most secretive and mysterious nations in the world today. In early 2001 cartoonist Guy Delisle became one of the few Westerners to be allowed access to the fortresslike country. 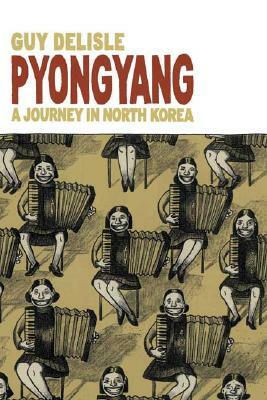 While living in the nation's capital for two months on a work visa for a French film animation company, Delisle observed what he was allowed to see of the culture and lives of the few North Koreans he encountered; his findings form the basis of this remarkable graphic novel. "Pyongyang "is an informative, personal, and accessible look at a dangerous and enigmatic country. Guy Delisle was born in Quebec City in 1966 and has spent the last decade living and working in France. He has written and drawn four graphic novels, including "Shenzhen," an account of his travels to China. "Pyongyang" is his first in English.